My Dura-Europos presents new data, an eyewitness account of the progress of an excavation carried out by a small group of three men and a woman in 'an alien world of threatened violence stirred up by turbulent tribal and international tribal and international politics,' and the sometimes naive reactions to exotic peoples and cultures of a young woman raised in the conservative American Midwest. Dura-Europos, founded by the Greeks in 300 BCE, became a remote outpost of the Roman Empire in western Asia until it was finally destroyed by a Persian army in the third century CE. It lay buried until it was rediscovered by British troops in the aftermath of World War I, at which time its intact religious sites, military equipment, tombs, and wall decorations were all excavated. 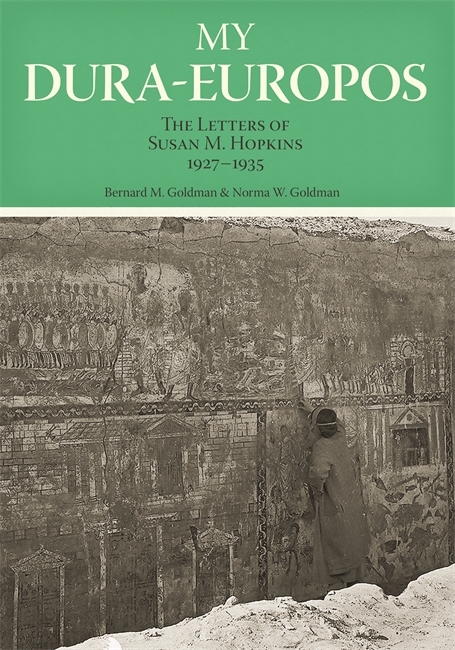 In My Dura-Europos: The Letters of Susan M. Hopkins, 1927–1935, authors Bernard M. Goldman and Norma W. Goldman collect and contextualize the correspondence of Susan Hopkins, who accompanied her husband, Clark Hopkins, to the archaeological dig at Dura-Europos, which was one of the most significant of the twentieth century. From a very personal female viewpoint, My Dura-Europos describes life at the remote excavation from the first season in 1928, when Susan and Clark were neophyte archaeologists, to 1935 when the project concluded. Susan writes of cataloging the finds, mending pottery, and acting as epigrapher by translating the inscriptions and dating the coins. In addition to these roles, Susan was assigned responsibility for organizing many of the day-to-day aspects of life in the camp, and later letters even describe her life as a mother in 1933–35, when she brought her young daughter along to the excavations. Susan’s lively, personal letters are organized and annotated by Bernard Goldman, whose deep knowledge of the sites and general history of archaeology and the region allows for a vivid and helpful commentary. After Bernard Goldman’s death, his wife, Norma Goldman, completed the manuscript and added over two hundred rare illustrations of the site and the archaeologists involved. Readers interested in archaeology and the history of the classical world will enjoy this fascinating inside look at life on the Dura-Europos site. Bernard M. Goldman was a professor in the art history department at Wayne State University, where, for forty years, he taught undergraduate courses in the history of art and graduate courses in the arts of central and western Asia and the history of sculpture. He is the author of The Sacred Portal, a study of entrances into holy places, and two books on the study of art history: Reading and Writing in the Arts and The Arts of Central and Western Asia. For ten years he was director of Wayne State University Press. Norma W. Goldman was a teacher of classics for forty years at Wayne State University, where she taught Latin, Greek drama, urban study of ancient Rome, and ancient Roman life. She is co-author of Latin via Ovid (Wayne State University Press, 1982) and English Grammar for Students of Latin. She is co-author of Cosa, the Lamps: Volume 39 of the Memoirs of the American Academy of Rome, where she has been a visiting scholar for the last thirty years. My Dura-Europos is a treasure trove of information and background for the social context of archaeology in the 1920s and '30s and provides a fascinating point of view on the discoveries at Dura, as well as intriguing observations on life at the American Academy and at the American School in Athens. Bernard M. Goldman's wonderful, deep knowledge of the sites and the history of archaeology and the field of the Hellenistic and Roman East allows him to comment in a vivid and helpful way on the references in Hopkins's letters, including the veritable parade of the leading archaeologists of the time." Susan M. Hopkins participated in one of the most momentous discoveries in the history of archaeology in the twentieth century and recorded her experiences in her letters in a lively, personal style. My Dura-Europos presents new data, an eyewitness account of the progress of an excavation carried out by a small group of three men and a woman in 'an alien world of threatened violence stirred up by turbulent tribal and international politics,' and the sometimes naive reactions to exotic peoples and cultures of a young woman raised in the conservative American Midwest."